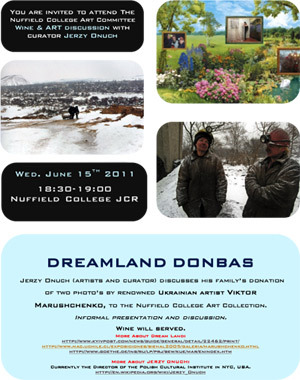 Jerzy Onuch (artist and curator) discusses his family's donation of two photos's by renowned Ukrainian artist Viktor Marushchenko to the Nuffield College Art Collection. 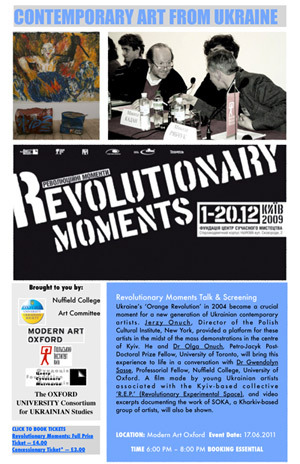 Currently Director of the Polish Cultural Institute in New York, USA. Ukraine’s ‘Orange Revolution’ in 2004 became a crucial moment for a new generation of Ukrainian contemporary artists. Jerzy Onuch, Director of the Polish Cultural Institute, New York, provided a platform for these artists in the midst of the mass demonstrations in the centre of Kyiv. He and Dr Olga Onuch, Petro-Jacyk Post-Doctoral Prize Fellow, University of Toronto, and President Emerita of the OUUS, will bring this experience to life in a conversation with Dr Gwendolyn Sasse, Professorial Fellow, Nuffield College, University of Oxford and a Senior Member of the OUUS. A film made by young Ukrainian artists associated with the Kyiv-based collective ‘R.E.P.’ (Revolutionary Experimental Space), and video excerpts documenting the work of SOKA, a Kharkiv-based group of artists, will also be shown. Lunchtime seminar by Prof. Timothy Snyder (Yale University). Professor Timothy Snyder received his doctorate from the University of Oxford in 1997, where he was a British Marshall Scholar. He has held fellowships in Paris and Vienna, and an Academy Scholarship at Harvard. Presently he teaches East European politics and history at Yale University. He is the author of Nationalism, Marxism, and Modern Central Europe: A Biography of Kazimierz Kelles-Krauz (Harvard University Press, 1998, Halecki Prize); The Reconstruction of Nations: Poland, Ukraine, Lithuania, Belarus, 1569-1999 (Yale University Press, 2003, awards from American Historical Association, American Association for Ukrainian Studies, Przeglad Wschodni, and Marie Curie-Sklodowska University); Sketches from a Secret War: A Polish Artist's Mission to Liberate Soviet Ukraine (Yale University Press, 2005, Pro Historia Polonorum award); The Red Prince: The Secret Lives of A Habsburg Archduke (Basic Books, 2008), and Bloodlands: Europe Between Hitler and Stalin (Basic Books, 2010). He is also the co-editor of Wall Around the West: State Power and Immigration Controls in Europe and North America (Rowman and Littlefield, 2001). 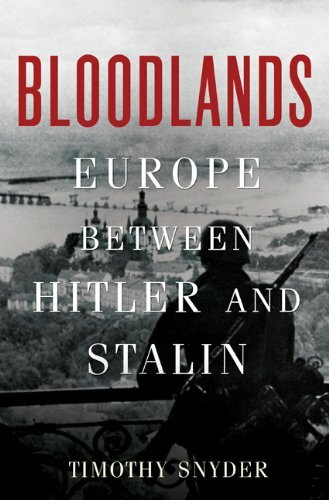 His most recent book is Bloodlands: Europe Between Hitler and Stalin, a history of Nazi and Soviet mass killing on the lands between Berlin and Moscow. It is a New York Times bestseller and a book of the year according to The Atlantic, The Independent, The Financial Times, the Telegraph, The Economist, History Today, the Seattle Times and the New Statesman. Ukraine's domestic and foreign affairs: Visions for the future. Oxford International Festival is an annual event organised by the International Students' Campaign to celebrate international students' diversity in the university. It is a great opportunity of different countries to showcase their national food, music, and costumes. Oxford University Ukrainian Society presented a variety of delicious Ukrainian meals: pumpkin kasha (гарбузова каша), vareniki (вареники), and vinegret (винегрет). We were not secretive and also shared the recipes. It is our great delight to say that we were among the most popular stands. Good job, Ukraine! Traditional social event for the new and old members. This time, it was a formal dinner at Merton College followed by an extensive discussion on the society future plans. 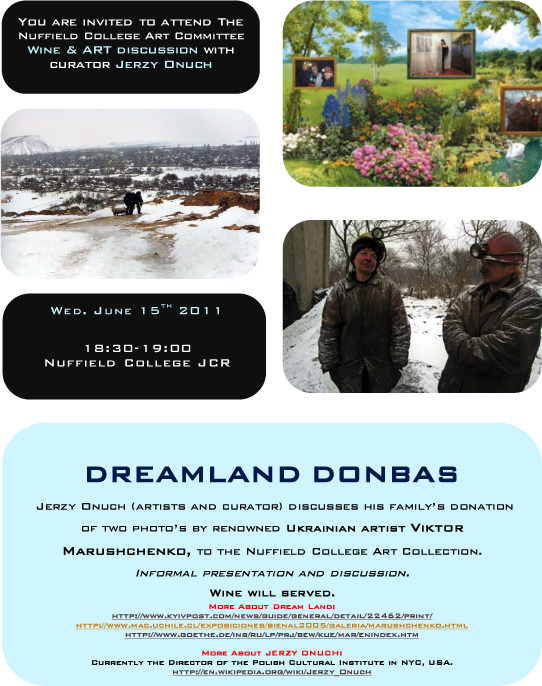 On 13 January 2011, the Oxford University Ukrainian Society in cooperation with the Ukrainian Embassy in London hosted a delegation of Ukrainian government officials and scholars. The group included Dmytro Tabachnyk, the Minister of Education and Science of Ukraine; Ihor Nekrassa, the Head of the Minister's Administration; Olexandr Udod, the Head of the Institute of Innovation and Education; Yuri Bobalo, the Head of Lviv National Technological University; Sergiy Shkarlet, the Head of Chernihiv State Technological University; Volodymir Onischenko, the Head of Poltava National Technological University; Olena Bobalo the representative of the Lviv National Technological University; and Pavlo Kartashov and Dmytro Dniprovoi from the Ukrainian Embassy. This visit was part of an initiative of the President of Ukraine, Victor Yanukovych, to adopt the know-how from the best educational practices in the world in lieu of Ukraine's national education system reform. Walking Tour with OU Walking Club: A walking tour through the area of outstanding natural beauty. Route: tbc, Date: tbc (weekend), Time: tbc. Venue: St Antony’s College, Date: 4 November 2010, Time: 5 pm. A perfect opportunity to meet old and new members of the OUUS, share a drink and find out about Society’s past and future activities !!! Venue: tbc, Date: 27 October 2010, Time: 8 pm. Venue: Centre for European Reforms, London, Date: 20 October 2010, Time: 4 – 5.30 pm. Venue: Examination Schools, Date: 6-8 October 2010, Time: 9:30 am - 4:30 pm daily.